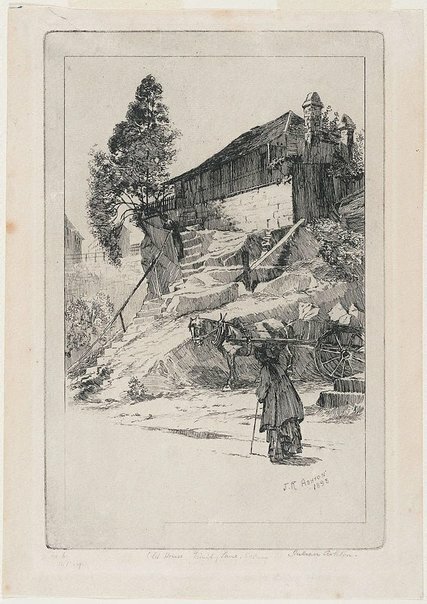 This etching of street life in the Rocks come from a second edition of fourteen, which Ashton published in 1918, printed in a blue/black ink, rather than the original sepia colour of 1893. The Gallery acquired the print that year from Angus and Robertson, a firm of booksellers and publishers in Castlereagh Street. Despite the plate having been etched some twenty-five years earlier, its reissue for a new market indicates the popularity of the subject, as Sydney, especially the Rocks, underwent widespread slum clearances following outbreaks of bubonic plague in the first decades of the century. Nostalgia grew for a Sydney of the past, and artists including Lionel Lindsay and Sydney Ure Smith produced prints of 'old Sydney' well into 1910s, 20s and even 30s. Signed and dated within plate to print l.r., "J.R.ASHTON/ 1893". Signed l.r., pencil "Julian Ashton".